20 A None No Power Seat 20 A is a standard Business Class seat whose proximity to the lavatories and galleys may be bothersome. 20 C None No Power Seat 20 C is a standard Business Class seat whose proximity to the lavatories and galleys may be bothersome. 20 D None No Power Seat 20 D is a standard Business Class seat whose proximity to the lavatories and galleys may be bothersome. 20 G None No Power Seat 20 G is a standard Business Class seat whose proximity to the lavatories and galleys may be bothersome. 20 H None No Power Seat 20 H is a standard Business Class seat whose proximity to the lavatories and galleys may be bothersome. 20 K None No Power Seat 20 K is a standard Business Class seat whose proximity to the lavatories and galleys may be bothersome. 21 A None No Power Seat 21 A is a standard Business Class Bulkhead seat whose proximity to the galley may be bothersome. 21 C None No Power Seat 21 C is a standard Business Class Bulkhead seat whose proximity to the galley may be bothersome. 21 D None No Power Seat 21 D is a standard Business Class Bulkhead seat whose proximity to the galley may be bothersome. 21 G None No Power Seat 21 G is a standard Business Class Bulkhead seat whose proximity to the galley may be bothersome. 21 H None No Power Seat 21 H is a standard Business Class Bulkhead seat whose proximity to the galley may be bothersome. 21 K None No Power Seat 21 K is a standard Business Class Bulkhead seat whose proximity to the galley may be bothersome. 24 H None No Power Seat 24 H is a standard Business Class seat. 50 A None No Power Seat 50 A is a standard Premium Economy Class seat that has extra legroom due to the position of the bulkhead. Users have reported that it is ideal for couples and is not recommended for solo travelers. 50 C None No Power Seat 50 C is a standard Premium Economy Class seat that has extra legroom due to the position of the bulkhead. Users have reported that it is ideal for couples and is not recommended for solo travelers. 50 H None No Power Seat 50 H is a standard Premium Economy Class seat that has extra legroom due to the position of the bulkhead. Users have reported that it is ideal for couples and is not recommended for solo travelers. 50 K None No Power Seat 50 K is a standard Premium Economy Class seat that has extra legroom due to the position of the bulkhead. Users have reported that it is ideal for couples and is not recommended for solo travelers. 51 A None No Power Seat 51 A is a standard Premium Economy Class seat. 51 C None No Power Seat 51 C is a standard Premium Economy Class seat. 51 H None No Power Seat 51 H is a standard Premium Economy Class seat. 51 K None No Power Seat 51 K is a standard Premium Economy Class seat. 52 A None No Power Seat 52 A is a standard Premium Economy Class seat. 52 C None No Power Seat 52 C is a standard Premium Economy Class seat. 52 D None No Power Seat 52 D is a standard Premium Economy Class seat that may have slightly extra legroom due to the position of the bulkhead however, the proximity to the stairs may be bothersome. 52 E None No Power Seat 52 E is a standard Premium Economy Class seat that may have slightly extra legroom due to the position of the bulkhead however, the proximity to the stairs may be bothersome. 52 F None No Power Seat 52 F is a standard Premium Economy Class seat that may have slightly extra legroom due to the position of the bulkhead however, the proximity to the stairs may be bothersome. 52 G None No Power Seat 52 G is a standard Premium Economy Class seat that may have slightly extra legroom due to the position of the bulkhead however, the proximity to the stairs may be bothersome. 52 H None No Power Seat 52 H is a standard Premium Economy Class seat. 52 K None No Power Seat 52 K is a standard Premium Economy Class seat. 53 A None No Power Seat 53 A is a standard Premium Economy Class seat. 53 C None No Power Seat 53 C is a standard Premium Economy Class seat. 53 D None No Power Seat 53 D is a standard Premium Economy Class seat. 53 E None No Power Seat 53 E is a standard Premium Economy Class seat. 53 F None No Power Seat 53 F is a standard Premium Economy Class seat. 53 G None No Power Seat 53 G is a standard Premium Economy Class seat. 53 H None No Power Seat 53 H is a standard Premium Economy Class seat. 53 K None No Power Seat 53 K is a standard Premium Economy Class seat. 54 A None No Power Seat 54 A is a standard Premium Economy Class seat. 54 C None No Power Seat 54 C is a standard Premium Economy Class seat. 54 D None No Power Seat 54 D is a standard Premium Economy Class seat. 54 E None No Power Seat 54 E is a standard Premium Economy Class seat. 54 F None No Power Seat 54 F is a standard Premium Economy Class seat. 54 G None No Power Seat 54 G is a standard Premium Economy Class seat. 54 H None No Power Seat 54 H is a standard Premium Economy Class seat. 54 K None No Power Seat 54 K is a standard Premium Economy Class seat. 55 A None No Power Seat 55 A is a standard Premium Economy Class seat. 55 C None No Power Seat 55 C is a standard Premium Economy Class seat. 55 D None No Power Seat 55 D is a standard Premium Economy Class seat. 55 E None No Power Seat 55 E is a standard Premium Economy Class seat. 55 F None No Power Seat 55 F is a standard Premium Economy Class seat. 55 G None No Power Seat 55 G is a standard Premium Economy Class seat. 55 H None No Power Seat 55 H is a standard Premium Economy Class seat. 55 K None No Power Seat 55 K is a standard Premium Economy Class seat. 56 A None No Power Seat 56 A is a standard Premium Economy Class seat. 56 C None No Power Seat 56 C is a standard Premium Economy class seat whose proximity to the lavatories and galleys may be bothersome. 56 D None No Power Seat 56 D is a standard Premium Economy class seat whose proximity to the lavatories and galleys may be bothersome. 56 E None No Power Seat 56 E is a standard Premium Economy class seat whose proximity to the lavatories and galleys may be bothersome. 56 F None No Power Seat 56 F is a standard Premium Economy class seat whose proximity to the lavatories and galleys may be bothersome. 56 G None No Power Seat 56 G is a standard Premium Economy class seat whose proximity to the lavatories and galleys may be bothersome. 56 H None No Power Seat 56 H is a standard Premium Economy class seat whose proximity to the lavatories and galleys may be bothersome. 56 K None No Power Seat 56 K is a standard Premium Economy Class seat. 57 A None No Power Seat 57 A is a standard Premium Economy class seat whose proximity to the lavatories and galleys may be bothersome. 57 C None No Power Seat 57 C is a standard Premium Economy class seat whose proximity to the lavatories and galleys may be bothersome. 57 H None No Power Seat 57 H is a standard Premium Economy class seat whose proximity to the lavatories and galleys may be bothersome. 57 K None No Power Seat 57 K is a standard Premium Economy class seat whose proximity to the lavatories and galleys may be bothersome. 60 A None No Power Seat 60 A is a standard Economy Class Bulkhead seat whose proximity to the galleys may be bothersome. The tray table is in the armrest, making the armrest immovable and slightly reducing seat width. There is no floor storage for this seat during take-off or landing. 60 B None No Power Seat 60 B is a standard Economy Class Bulkhead seat whose proximity to the galleys may be bothersome. The tray table is in the armrest, making the armrest immovable and slightly reducing seat width. There is no floor storage for this seat during take-off or landing. 60 C None No Power Seat 60 C is a standard Economy Class Bulkhead seat whose proximity to the galleys may be bothersome. The tray table is in the armrest, making the armrest immovable and slightly reducing seat width. There is no floor storage for this seat during take-off or landing. 60 H None No Power Seat 60 H is a standard Economy Class Bulkhead seat whose proximity to the galleys may be bothersome. The tray table is in the armrest, making the armrest immovable and slightly reducing seat width. There is no floor storage for this seat during take-off or landing. 60 J None No Power Seat 60 J is a standard Economy Class Bulkhead seat whose proximity to the galleys may be bothersome. The tray table is in the armrest, making the armrest immovable and slightly reducing seat width. There is no floor storage for this seat during take-off or landing. 60 K None No Power Seat 60 K is a standard Economy Class Bulkhead seat whose proximity to the galleys may be bothersome. The tray table is in the armrest, making the armrest immovable and slightly reducing seat width. There is no floor storage for this seat during take-off or landing. 61 D None No Power Seat 61 D is a standard Economy Class Bulkhead seat whose proximity to the galleys may be bothersome. The tray table is in the armrest, making the armrest immovable and slightly reducing seat width. There is no floor storage for this seat during take-off or landing. 61 E None No Power Seat 61 E is a standard Economy Class Bulkhead seat whose proximity to the galleys may be bothersome. The tray table is in the armrest, making the armrest immovable and slightly reducing seat width. There is no floor storage for this seat during take-off or landing. 61 F None No Power Seat 61 F is a standard Economy Class Bulkhead seat whose proximity to the galleys may be bothersome. The tray table is in the armrest, making the armrest immovable and slightly reducing seat width. There is no floor storage for this seat during take-off or landing. 61 G None No Power Seat 61 G is a standard Economy Class Bulkhead seat whose proximity to the galleys may be bothersome. The tray table is in the armrest, making the armrest immovable and slightly reducing seat width. There is no floor storage for this seat during take-off or landing. 73 D None No Power Seat 73 D is a standard Economy Class seat whose proximity to the lavatories may be bothersome. 73 E None No Power Seat 73 E is a standard Economy Class seat whose proximity to the lavatories may be bothersome. 73 F None No Power Seat 73 F is a standard Economy Class seat whose proximity to the lavatories may be bothersome. 73 G None No Power Seat 73 G is a standard Economy Class seat whose proximity to the lavatories may be bothersome. 74 A None No Power Seat 74 A is a standard Economy Class seat whose proximity to the lavatories may be bothersome. 74 B None No Power Seat 74 B is a standard Economy Class seat whose proximity to the lavatories may be bothersome. 74 C None No Power Seat 74 C is a standard Economy Class seat whose proximity to the lavatories may be bothersome. 74 H None No Power Seat 74 H is a standard Economy Class seat whose proximity to the lavatories may be bothersome. 74 J None No Power Seat 74 J is a standard Economy Class seat whose proximity to the lavatories may be bothersome. 74 K None No Power Seat 74 K is a standard Economy Class seat whose proximity to the lavatories may be bothersome. 75 B None No Power Seat 75 B is a standard Economy Class seat that has extra legroom due to the exit however, the close proximity to the lavatories may be bothersome. The tray table is in the armrest, making the armrest immovable and slightly reducing seat width. There is no floor storage for this seat during take-off and landing. 75 C None No Power Seat 75 C is a standard Economy Class seat that has extra legroom due to the exit however, the close proximity to the lavatories may be bothersome. The tray table is in the armrest, making the armrest immovable and slightly reducing seat width. There is no floor storage for this seat during take-off and landing. 75 H None No Power Seat 75 H is a standard Economy Class seat that has extra legroom due to the exit however, the close proximity to the lavatories may be bothersome. The tray table is in the armrest, making the armrest immovable and slightly reducing seat width. There is no floor storage for this seat during take-off and landing. 75 J None No Power Seat 75 J is a standard Economy Class seat that has extra legroom due to the exit however, the close proximity to the lavatories may be bothersome. The tray table is in the armrest, making the armrest immovable and slightly reducing seat width. There is no floor storage for this seat during take-off and landing. 76 A None No Power Seat 76 A is a standard Economy Class seat that has extra legroom due to the missing seat in front. 76 D None No Power Seat 76 D is a standard Economy Class Bulkhead seat whose proximity to the lavatories may be bothersome. The tray table is in the armrest, making the armrest immovable and slightly reducing seat width. There is no floor storage for this seat during take-off or landing. 76 E None No Power Seat 76 E is a standard Economy Class Bulkhead seat whose proximity to the lavatories may be bothersome. The tray table is in the armrest, making the armrest immovable and slightly reducing seat width. There is no floor storage for this seat during take-off or landing. 76 F None No Power Seat 76 F is a standard Economy Class Bulkhead seat whose proximity to the lavatories may be bothersome. The tray table is in the armrest, making the armrest immovable and slightly reducing seat width. There is no floor storage for this seat during take-off or landing. 76 G None No Power Seat 76 G is a standard Economy Class Bulkhead seat whose proximity to the lavatories may be bothersome. The tray table is in the armrest, making the armrest immovable and slightly reducing seat width. There is no floor storage for this seat during take-off or landing. 76 K None No Power Seat 76 K is a standard Economy Class seat that has extra legroom due to the missing seat in front. 87 A None No Power Seat 87 A is a standard Economy Class seat whose proximity to the galleys may be bothersome. 87 B None No Power Seat 87 B is a standard Economy Class seat whose proximity to the galleys may be bothersome. 87 C None No Power Seat 87 C is a standard Economy Class seat whose proximity to the galleys may be bothersome. 87 D None No Power Seat 87 D is a standard Economy Class seat whose proximity to the galleys may be bothersome. 87 E None No Power Seat 87 E is a standard Economy Class seat whose proximity to the galleys may be bothersome. 87 F None No Power Seat 87 F is a standard Economy Class seat whose proximity to the galleys may be bothersome. 87 G None No Power Seat 87 G is a standard Economy Class seat whose proximity to the galleys may be bothersome. 87 H None No Power Seat 87 H is a standard Economy Class seat whose proximity to the galleys may be bothersome. 87 J None No Power Seat 87 J is a standard Economy Class seat whose proximity to the galleys may be bothersome. 87 K None No Power Seat 87 K is a standard Economy Class seat whose proximity to the galleys may be bothersome. 88 A None No Power Seat 88 A is a standard Economy Class Bulkhead seat whose proximity to the galleys may be bothersome. The tray table is in the armrest, making the armrest immovable and slightly reducing seat width. There is no floor storage for this seat during take-off or landing. 88 B None No Power Seat 88 B is a standard Economy Class Bulkhead seat whose proximity to the galleys may be bothersome. The tray table is in the armrest, making the armrest immovable and slightly reducing seat width. There is no floor storage for this seat during take-off or landing. 88 C None No Power Seat 88 C is a standard Economy Class Bulkhead seat whose proximity to the galleys may be bothersome. The tray table is in the armrest, making the armrest immovable and slightly reducing seat width. There is no floor storage for this seat during take-off or landing. 88 D None No Power Seat 88 D is a standard Economy Class Bulkhead seat whose proximity to the galleys may be bothersome. The tray table is in the armrest, making the armrest immovable and slightly reducing seat width. There is no floor storage for this seat during take-off or landing. 88 E None No Power Seat 88 E is a standard Economy Class Bulkhead seat whose proximity to the galleys may be bothersome. The tray table is in the armrest, making the armrest immovable and slightly reducing seat width. There is no floor storage for this seat during take-off or landing. 88 F None No Power Seat 88 F is a standard Economy Class Bulkhead seat whose proximity to the galleys may be bothersome. The tray table is in the armrest, making the armrest immovable and slightly reducing seat width. There is no floor storage for this seat during take-off or landing. 88 G None No Power Seat 88 G is a standard Economy Class Bulkhead seat whose proximity to the galleys may be bothersome. The tray table is in the armrest, making the armrest immovable and slightly reducing seat width. There is no floor storage for this seat during take-off or landing. 88 H None No Power Seat 88 H is a standard Economy Class Bulkhead seat whose proximity to the galleys may be bothersome. The tray table is in the armrest, making the armrest immovable and slightly reducing seat width. There is no floor storage for this seat during take-off or landing. 88 J None No Power Seat 88 J is a standard Economy Class Bulkhead seat whose proximity to the galleys may be bothersome. The tray table is in the armrest, making the armrest immovable and slightly reducing seat width. There is no floor storage for this seat during take-off or landing. 88 K None No Power Seat 88 K is a standard Economy Class Bulkhead seat whose proximity to the galleys may be bothersome. The tray table is in the armrest, making the armrest immovable and slightly reducing seat width. There is no floor storage for this seat during take-off or landing. 89 A None No Power Seat 89 A is a standard Economy Class seat. 89 B None No Power Seat 89 B is a standard Economy Class seat. 89 C None No Power Seat 89 C is a standard Economy Class seat. 89 D None No Power Seat 89 D is a standard Economy Class seat. 89 E None No Power Seat 89 E is a standard Economy Class seat. 89 F None No Power Seat 89 F is a standard Economy Class seat. 89 G None No Power Seat 89 G is a standard Economy Class seat. 89 H None No Power Seat 89 H is a standard Economy Class seat. 89 J None No Power Seat 89 J is a standard Economy Class seat. 89 K None No Power Seat 89 K is a standard Economy Class seat. 90 A None No Power Seat 90 A is a standard Economy Class seat. 90 B None No Power Seat 90 B is a standard Economy Class seat. 90 C None No Power Seat 90 C is a standard Economy Class seat. 90 D None No Power Seat 90 D is a standard Economy Class seat. 90 E None No Power Seat 90 E is a standard Economy Class seat. 90 F None No Power Seat 90 F is a standard Economy Class seat. 90 G None No Power Seat 90 G is a standard Economy Class seat. 90 H None No Power Seat 90 H is a standard Economy Class seat. 90 J None No Power Seat 90 J is a standard Economy Class seat. 90 K None No Power Seat 90 K is a standard Economy Class seat. 91 A None No Power Seat 91 A is a standard Economy Class seat. 91 B None No Power Seat 91 B is a standard Economy Class seat. 91 C None No Power Seat 91 C is a standard Economy Class seat. 91 D None No Power Seat 91 D is a standard Economy Class seat. 91 E None No Power Seat 91 E is a standard Economy Class seat. 91 F None No Power Seat 91 F is a standard Economy Class seat. 91 G None No Power Seat 91 G is a standard Economy Class seat. 91 H None No Power Seat 91 H is a standard Economy Class seat. 91 J None No Power Seat 91 J is a standard Economy Class seat. 91 K None No Power Seat 91 K is a standard Economy Class seat. 92 A None No Power Seat 92 A is a standard Economy Class seat. 92 B None No Power Seat 92 B is a standard Economy Class seat. 92 C None No Power Seat 92 C is a standard Economy Class seat. 92 D None No Power Seat 92 D is a standard Economy Class seat. 92 E None No Power Seat 92 E is a standard Economy Class seat. 92 F None No Power Seat 92 F is a standard Economy Class seat. 92 G None No Power Seat 92 G is a standard Economy Class seat. 92 H None No Power Seat 92 H is a standard Economy Class seat. 92 J None No Power Seat 92 J is a standard Economy Class seat. 92 K None No Power Seat 92 K is a standard Economy Class seat. 93 A None No Power Seat 93 A is a standard Economy Class seat. 93 B None No Power Seat 93 B is a standard Economy Class seat. 93 C None No Power Seat 93 C is a standard Economy Class seat whose proximity to the lavatories may be bothersome. 93 D None No Power Seat 93 D is a standard Economy Class seat whose proximity to the lavatories may be bothersome. 93 E None No Power Seat 93 E is a standard Economy Class seat. 93 F None No Power Seat 93 F is a standard Economy Class seat. 93 G None No Power Seat 93 G is a standard Economy Class seat whose proximity to the lavatories may be bothersome. 93 H None No Power Seat 93 H is a standard Economy Class seat whose proximity to the lavatories may be bothersome. 93 J None No Power Seat 93 J is a standard Economy Class seat. 93 K None No Power Seat 93 K is a standard Economy Class seat. 94 A None No Power Seat 94 A is a standard Economy Class seat in the last row of the aircraft whose proximity to the lavatories may be bothersome. 94 B None No Power Seat 94 B is a standard Economy Class seat in the last row of the aircraft whose proximity to the lavatories may be bothersome. 94 C None No Power Seat 94 C is a standard Economy Class seat in the last row of the aircraft whose proximity to the lavatories may be bothersome. 94 D None No Power Seat 94 D is a standard Economy Class seat in the last row of the aircraft whose proximity to the lavatories may be bothersome. 94 E None No Power Seat 94 E is a standard Economy Class seat in the last row of the aircraft whose proximity to the lavatories may be bothersome. 94 F None No Power Seat 94 F is a standard Economy Class seat in the last row of the aircraft whose proximity to the lavatories may be bothersome. 94 G None No Power Seat 94 G is a standard Economy Class seat in the last row of the aircraft whose proximity to the lavatories may be bothersome. 94 H None No Power Seat 94 H is a standard Economy Class seat in the last row of the aircraft whose proximity to the lavatories may be bothersome. 94 J None No Power Seat 94 J is a standard Economy Class seat in the last row of the aircraft whose proximity to the lavatories may be bothersome. 94 K None No Power Seat 94 K is a standard Economy Class seat in the last row of the aircraft whose proximity to the lavatories may be bothersome. 95 A None No Power Seat 95 A is a standard Economy Class seat that has extra legroom due to the exit however, this seat is missing a window. 95 C None No Power Seat 95 C is a standard Economy Class seat that has extra legroom due to the exit. 95 D None No Power Seat 95 D is a standard Economy Class seat that has extra legroom due to the exit. 95 E None No Power Seat 95 E is a standard Economy Class seat that has extra legroom due to the exit. 95 F None No Power Seat 95 F is a standard Economy Class seat that has extra legroom due to the exit. 95 G None No Power Seat 95 G is a standard Economy Class seat that has extra legroom due to the exit. 95 H None No Power Seat 95 H is a standard Economy Class seat that has extra legroom due to the exit. 95 K None No Power Seat 95 K is a standard Economy Class seat that has extra legroom due to the exit however, this seat is missing a window. 96 A None No Power Seat 96 A is a standard Economy Class seat. 96 C None No Power Seat 96 C is a standard Economy Class seat. 96 D None No Power Seat 96 D is a standard Economy Class seat. 96 E None No Power Seat 96 E is a standard Economy Class seat. 96 F None No Power Seat 96 F is a standard Economy Class seat. 96 G None No Power Seat 96 G is a standard Economy Class seat. 96 H None No Power Seat 96 H is a standard Economy Class seat. 96 K None No Power Seat 96 K is a standard Economy Class seat. 97 A None No Power Seat 97 A is a standard Economy Class seat. 97 C None No Power Seat 97 C is a standard Economy Class seat. 97 D None No Power Seat 97 D is a standard Economy Class seat. 97 E None No Power Seat 97 E is a standard Economy Class seat. 97 F None No Power Seat 97 F is a standard Economy Class seat. 97 G None No Power Seat 97 G is a standard Economy Class seat. 97 H None No Power Seat 97 H is a standard Economy Class seat. 97 K None No Power Seat 97 K is a standard Economy Class seat. 98 A None No Power Seat 98 A is a standard Economy Class seat however, the proximity to the lavatory and galley may be bothersome. 98 C None No Power Seat 98 C is a standard Economy Class seat however, the proximity to the lavatory and galley may be bothersome. 98 D None No Power Seat 98 D is a standard Economy Class seat. 98 E None No Power Seat 98 E is a standard Economy Class seat. 98 F None No Power Seat 98 F is a standard Economy Class seat. 98 G None No Power Seat 98 G is a standard Economy Class seat however, the proximity to the lavatory and galley may be bothersome. 98 H None No Power Seat 98 H is a standard Economy Class seat however, the proximity to the lavatory and galley may be bothersome. 98 K None No Power Seat 98 K is a standard Economy Class seat however, the proximity to the lavatory and galley may be bothersome. 99 D None No Power Seat 99 D is a standard Economy Class seat however, the proximity to the lavatory and galley may be bothersome. 99 E None No Power Seat 99 E is a standard Economy Class seat however, the proximity to the lavatory and galley may be bothersome. 99 F None No Power Seat 99 F is a standard Economy Class seat however, the proximity to the lavatory and galley may be bothersome. This aircraft is equipped with Audio/Video on Demand (Panasonic eX2) which offers up to 400 CDs, audio books and 21 radio channels. This system is available via personal screens located in the seat backs. This aircraft is equipped with Audio/Video on Demand (Panasonic eX2) which offers up to 100 movies, 200 TV Programs, 15 games and several live TV Channels. The entertainment content is available in up to 25 languages. The system is available via personal screens located in the seat backs. First, Business, and Premium Economy class seats are equipped with 110V AC power ports and USB power. Economy class offers USB power. Lufthansa flies this version of their Airbus A380-800 in a four class configuration with 8 First Class open suites, 78 flat bed Business Class seats, 52 Premium Economy seats, and 371 standard Economy seats. Seat 52D (or G) in Premium Economy on the A380 is an odd seat where you feel like you're sitting in the middle of the aisle but the reality is its great for people who like their space, have long legs or prefer bulkhead seats in general. In terms of comfort, the leg rest, recline and seat pitch is far superior to United's Economy Plus but I think I'd still prefer United's new Premium Economy on long haul flights although I have yet to try it. If I take this flight again in the future, I would prefer to be in Row 50. I can't believe someone would say that 50A is not good for solo travelers. It's the best seat in premium economy for a solo traveler! You get a window seat that you can easily get in and out of (even with a meal tray on your tray table) without bothering the person in 50C which can't easily be done in any other window seat in premium economy. The bulkhead wall is far enough away that at 183cm I had my legs fully extended so no worries about leg room unless you're significantly taller than that. No one is reclining into you and there's no galleys or bathrooms to the front so no traffic passes by your seat. People have mentioned the fold out IFE screen that can't be used on take off or landing as a negative, but really it's less than 10% of a long haul flight and we all have music, videos, etc on our phones so who cares when you have all these positives? 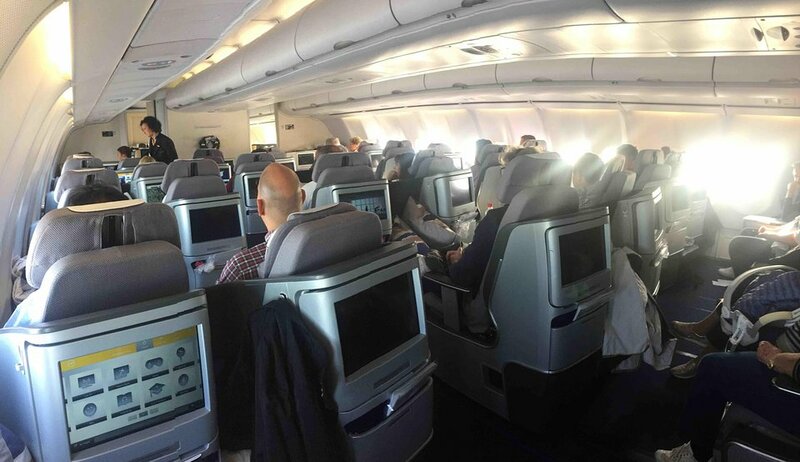 Lufthansa’s A380 economy class offers lot of comfort and legroom on the upper deck. The cabin is very quiet and meals are good for eco ones. Great ! My wife and I like the seats in the last row because we do not bother anyone when we move our seat backs. The angle of inclination of the backrest is in order. One should know that at Lufthansa, the inner armrests of these seats can only be folded upwards about 45 °, if you want to put a younger child across center square, this works only partially. The light of the toilet shield on the seat backs is quite bright. The traffic to the four toilets in the rear was manageable and did not bother us. At 94C, the Mediabox under seat 93C narrows the footwell a little. This seat has a fixed metal box on the right-hand side underneath the seat in front of it. It consumes roughly 1/3 of the legroom, making it difficult to stretch out or place any personal items under the seat. In addition, due to low overhead storage capacity, extra cabin baggage needed to be placed in business class, which could not be accessed during the flight. I have made 4 flights on Lufthansa to Munich and Frankfurt in the past year. Its a 11+ hour and requires business class to be enjoyable, Prem econ to be ok and Economy to teach you a lesson that over 7 hours you book Business.!!!. It is not that much more. I prefer the center 2x2 lie flat seats, as you have aisle access any time. Seats come with a large comforter and HUGE pillow and for the overnight flight you arrive well rested... Entertainment was excellent, headphones are bose! Food and wine great 5 course meal, mid flight snack and pre landing meal. These seats are actualy better than the First class !! ( flew those) This is Lufthansa's best after the A340. Skip the 747... but those are going away soon. Best economy seat in the aircraft for night flights! unlimited legroom. Downsides are no window view and having to stow the IFE during take-off and landing, which I did not like as I would like to watch the on-board cameras. The placement of the USB connector and earplugs is placed inconvenietly inward the seat which resulted in bumping into them all the time. Standard economy seat in the rear of the second deck. Unfortunately the entertainment screen was very small, unresponsive and damaged as well as other screens in the surrounding area making for a long 11 hour flight. The A380 is definitely starting to show its age in that respect. By sitting in this seat, you have one flight attendant dedicated to serving your economy section so service is quick and more personal than the lower deck economy. (Really helped make this flight much more enjoyable from MUC-MIA.) The overhead compartments appear to be a very reduced size making almost any hand luggage difficult to fit due to the tight squeeze. The seat itself is an average economy seat that is a bit tight for someone over 6ft, of course that is expected in an economy seat. I personally would not fly in any Lufthansa economy seat again due to the actual seat size and legroom but for shorter passengers this can be a good seat. This seat is not good because there is a box underneath 88H which holds the foldable entertainment system. It is very inconvenient to for your legs as there are sharp hard edges of this box. Described (and sold) by Lufthansa on their seating diagram and staff as an exit row seat (as is 76B) because of the area in front of 76A that provides access to the exit. However this is completely misleading, as shown on SeatGuru's more accurate seating diagram as just a regular economy seat. Furthermore, this seat has the media box under the seat in front that results in very limited legroom. Seats 52 D and G are not "bulkhead" as the stairs' backside is only in front of of E and F. Both have unlimited leg space and only very little "traffic" as the stairs are closed during flight. Underneath the stairs in front are crew wardrobes which may be used by passengers as well (if kindly asked for), providing convenient space for personal stuff or trolleys during take-off and landing. There are also baby bassinets in front of E and F, this might be a drawback. I liked the separate PE cabin - but this was spoiled by crying infants. The seat does not have separate reading light (that in the overhead did not work), and it has no leg support. Seat itself was not very comfortable. Good leg room, though. Overall, PE on LH is not worth the considerable extra money paid. Great seat. Economy seats in the upper deck are more specious than lower deck. There is additional storage space integrated in the extended window sill. This window sill can also be used as table. Since there is no one sitting behind you, you can put your seat back throughout the flight without bothering other passengers. There is only one lavatory on the other side of the upper deck back of this aircraft, so no inconvenience by that. You are still free to go down the stairs to use the lavatories of the lower deck if upper deck one is already taken. Also, the galley gets used barely, as the economy section is small. So no inconvenience, fast service and easy to grab yourself a drink during the flight. The extra legroom was nice, however, it was inconvenient not being able to have my personal item by my feet. I will never fly again with this company as economy seats are so small and so uncomfortable this for nearly 10 hours flight, and you pay for it as well, I used before the upper deck 98K wich is now not available to book even paying for it. I am average european size. Overall a solid seat. You get to enjoy the intimacy of the upper deck mini-cabin, and with the exit door you have essentially unlimited legroom. As the chart says, you do not have a window besides a small one on the door that is not really visible from your seat. You can barely see a bit outside the window behind you once the seat is reclined. The large exit door does impede your space slightly, but it didn't have a huge effect. I found it a bit difficult getting in and out of the seat due to the aggressive curvature of the wall. We flew now for 3 times on these seats and enjoyed it very well due to the fact of having the last row. So reclining of the seats was no issue to any people in the back, as there weren't any. These seats also have extra storage space beside the window with a flat top lid, which can be used to store huge amounts of stuff. Also the flat lid is good for putting books or devices for easy reach. 52D has great legroom and nothing in front. Drawbacks on this seat are the smaller display due to the IFE in the armrest; missing storage space. 89K has almost no under seat storage or legroom, as there is a media box under the seat in front of you. Limited legroom due to media box under the front seat. The exit of the a/c is right above the seat, catched a cold during the flight from FRA to IAH. Not recommended at all. very nice seat. Extra legroom. But it will be a little bothersome when the flight is fully booked because there is no seat pocket and underseat storage room. Besides the crew opened the comparment in front of me from time to time. A little annoying. I was booked for 76E in front of the bulkhead. These places are ususally booked for families with babies and small childs. It happend that I was squeezed between two mommies with their babies. Since I'm 182cm tall I couldn't stretch my legs which is quite painful. I was happy to get the seat exchanged and was able to get seat 63K instead. It is not possible to keep a backpack under the seat in front (60B). So if your planning to have a big backpack with you on the flight, better have another seat. Do not recommend this seat. There is a mediabox under the seat in front of you (60A) and you cannot stretch out your legs. The Business-class seat 22A is located in the smaller section of the business-area (only 4 rows), that is separated by galley+toilette from the rest of the business-class. Therefore you have not the feeling of being in a huge airplane. Behind you there are 4 to 5 rows of standard economy class, but this is no problem at all, since they have their own toilette. So, overall there is no big traffic in this section, and especially toilettes are not bothering you at all, which I find very convenient. Seat is very comfortable, since the hardness of the seat is adjustable, and 180°-recline gives me a good sleep. What I have noticed from other passengers: all window-seat have big advantage compared to the other seats: You have much more storage-room beneath the window (compared to all other seats), and the (very tiny) space for your feet (when 180°-reclined) you dont have to share with your neighbor (compared to the middle-seats), means no knee-bumping. In summary, I will only chose window-seats, when travelling in biz of LH A380. The food was nice, many variants you can select from, service was rather quick, and the flight-attendances are really friendly and thoughtful. Seats are equipped with Bose-noise-cancelling system, small version. This is only a very little detail, but worth mentioning, because it changes the acoustic experience during your travel dramatically. Note: take care of your belongings when adjusting your seat; it may happen, that mobile-phones etc. can fall down through the space between the movable parts of the seat (and there is very much movement, when you fully recline your seat! Its ballet-like to watch all seat-parts change their position until the flat-bed is ready). You need assistance, if you want to have it back. Even though this seat is 4 rows away from the lavatory, and I was in the window seat, the noise of the lavatories was loud enough to wake me up despite wearing earplugs. This has never been a problem for me when seated even closer to the lavatories on other aircraft, and I have discussed this with other frequent travelers who also report that they find the lavatory much noisier on the Lufthansa A380 than on other aircraft. Economy seats on the upper deck are narrow and the RH seat of each pair had a metal box restricting leg space. No USB or power, at least upstairs. On the plus side, service was very good and the plane exit swift as you follow business class out. This seat is an excellent example of Lufthansa's largely unsuccessful "value engineering", which you can see pretty much everywhere on this A380. While the plane itself is excellent, the seat makes your flight less than pleasurable. I was in seat 11D on my recent round trip IAH-FRA-IAH (both legs). The major deficiencies of the seat are: it is too narrow; the foot well is tiny; the foot wells of two adjacent seats are so close that you are constantly rubbing your legs against your neighbors; there is very little room around the seat; the seats have armrests on just one side - your other "armrest" is the console separating two adjacent seats and the console is significantly higher than the armrest, so, if you want to rest both of your arms you are sitting in a twisted pose; the seat control panel's location is such that it is very easy to press on those buttons accidentally; my seat had a tendency to re-adjust its firmness on its own - which felt really weird. The seat 11D is close to a lavatory, so, get ready to be exposed to some strong aromas sometimes coming out of that lavatory. The lavatories in business class cabin are tiny. The service during the flight (including food and drinks) is OK. I would fly on this plane in business class only if I am not paying for the ticket. The $6K, which my employer paid for my ticket, is way too much for what Lufthansa offers. Their claim of a 5-star status does not seem justified. very good economy premium seat. Lot of space though I'm 1.82. In my flight the premium was half empty and thus no neighbor. Food is as a rule now, scarce. The seat 60K has some metal box underneath, on the right side, therefore my seat 61K was awful in terms of legroom, especially the right leg. There was very little space for legs, comparing to 61J or 61H for example. Definitely the best seat in PE (as well as 52G). Unlimited legroom, no seat in front, no traffic from lavatories or galley as they are in the back. Only minor issue: the monitor is smaller as on other seats. Overall do not recommend this seat. There is a metal box under the right side of the seat in front, so cannot stretch out your right leg. Also, no chance of keeping a backpack under the seat in front of you prefer to do that and keep both legs folded the whole flight. Under the seat in the front of seat 76H is a box with a life vest. For this reason, there es less space for feet/leg. IFE Box under seat 60 H and 60 K which blocks feet space under the seats. So avoid seat 61 H and 61 K if you have long legs and need to be able to move your feet. Please updated with yello now in the seating plan! Limited legroom, also for 96e, as a metal box shaped object obstructs the right leg from expanding. For 96e the exact same object obstructs his/her left leg. This seems to be the case for all middle row seats. Hard to believe for this relatively new designed plane, as the metal box clearly seems a part of the construction. 94C is an aisle seat on the last raw. The bad side of the things is, that the toilets and the stairway are just behind. That means noise from the flush toilets and steady stream of passengers. The good things are two: just behind the seat there is a wall and between the seat and that wall it is possible to place some of your hand baggage, very easy to be reached. Also at the 12h long flight from Frankfurt to Singapore toilets are easy for access and there is a place there to have a walk around the stairway for the upper floor and to stretch your legs. SFO to FRA with connection to VCE. Very comfortable seat, attentive attendants and tasty food and drink. What more can you want from a flight these days. Ask about what is in the vino-tech and you may be pleasantly surprised. We enjoyed a very nice Gruner Veltliner that was not on the printed wine list. The down side of making a connection through Frankfort is that you have to go through Customs and Security again and it can take well over an hour. This is really the best seat. Row 75 blocks light from lavatory (whenever door opens/close, you get sudden bright lights coming on and off). however, the seat rest is rigid and cannot be retracted. My flight was only half full and many people had an entire row to themselves. They could retract the arm rest and lie down (3 across 3 seats). But for Row 76, since the arm rest is rigid, this is not possible). LAX-FRA in economy class(seats 79B and C). Legroom comparable to low cost carriers (i.e. - non-existent). Additionally the media box under the middle seat. Lufthansa's service is good, as is food, but space for passengers is less than scarce. I'm 195 cm tall and sat 10 hours with my knees hardly pressed against the preceding seat (sitting straight up). One lady trying to sleep was constantly voicing loudly her dissatisfaction that people in row behind her willing to visit bathroom would grab her seat and wake her up by using it as help to stand up. She could not understand that there was virtually no possibility to stand up and go to lavatory without disturbing passengers in front. In terms of space, cattle class at its worst. The wideness of the seat is smaller compared to standard Economy Seats! Seat is fine, luggage compartment not big enough due to curvature of plane in front. On a flight together with my wife, seats 97 H and K were great for: no middle seat, rather small Economy/Upper Deck compartment felt more private, extra storage room in a "drawer" between seats and Windows. The latter proved very practical on the long flight. The larger distance between seat and window due to the shape od the plane did not hamper the view. Very friendly and personal Service, maybe due to the proximity of the Business Class on the same deck. The seat is quite comfy and flat. You can get a good sleep. The service is good too. We thought these upper-deck side rear seats (98H/K) were *great* (possibly the best economy seats on the plane) because there is no one behind -- which means no one touching the seat and extra gear stowage behind and under the seats -- but the seats still recline fully. The extra stowage means you don't have to have anything under the seat in front, so you can stretch legs out completely. The proximity to the lavatory was hardly noticeable at all, because that is mostly only used by the people in upper-deck economy (only 35 seats). 98A/C are probably similar except the galley is a little more noisy than the lavatory. Note that the upstairs overhead stowage is tiny, not large enough for a rollerboard. Worst seat ever! Noisy - its next to the galley. Poorly designed - armrests uneven, seat horribly uncomfortable, seat electronics old and sketchy ... terrible experience. Media box in the leg room took a lot of space I would've needed for my legs. This is a BAD seat because you have one half the space under the seat in front of you as all the other seats. There is a silver box. I had to store my stuff in an over head bin and there was barely enough room for a pair of sandals under the seat. Great seat. Plenty of legroom. No traffic from the stairs, and even the largest person have enough space! Great service. I would have to agree with a lot of the comments regarding 96C, due to the electronics box in front, it is impossible to stretch your left leg. I flew in this seat from San Francisco to Frankfurt. The proximity to the galley was not bothering me. It even had an advantage: you were closer to the Lavatory than many other passangers. The only thing I did not like was the position the seat is placed: If you do not know the passenger sitting to your left it might be a bit uncofortable, because you see them all the time. However towards the end of my flight I made a new friend because of this. Flew in this seat for 12 hours overnight from Frankfurt to Sydney. Can't say the lavatories are bothersome at all, I wasn't disturbed by people using them at all. In general the upper deck economy is very nice, there's extra storage for the window seats below the windows and the atmosphere is a lot less "cattle transport"-like than in the main cabin downstairs. Especially for couples, the seatpairs by the windows on the upper deck are great. The only issue was the lack of sufficient legroom, but I'm 188cm and it's economy class. For tall people I recommend row 95A, C, H or K. Those are well worth the extra fee. Seat 98K is still good though. Upper deck economy is nice an more private than the main cabin. Less of a "cattle transport" feel. Seat 95A is great. It does not have a window, but there's unlimited legroom and absolutely no source of disturbance like lavatories or the like close by. I highly recommend this. Personell was nice but service overall was mediocre, as always with Lufthansa. I do not think this seat offers extra legroom. Yes there is no seat in front, therefore you have more knee space. However because of the bulkhead you have limited legroom. On my flight back I sat in a different row and it was much more comfortable because I could stretch out my legs under the seat in front of me. I do not! recommend the first row at all, unless you're planning on working the entire flight and are using a notebook. The seat has a media box in the legroom which makes it rather uncomfortable to sit. Flew on this seat from LA to Frankfurt. This seat was not that good. Premium Economy was worth the upgrade, but nothing much was different from economy. The legroom was pretty restricted, since my knees kept hitting the seat in front, during take off, landing, or turbulence. Food was nothing really special. It was like in economy, except that they gave you a menu, and 1 more choice of each course. The tray table was better, since it came out of the armrests. Overall a better selection of wines, and a slightly bigger selection of movies (I think) The seats were comfortable and reclined more, than in economy class. The seats were new, but the entertainment screen was very slow and kept blurring out during even, the slightest turbulence. This seat is not that good, but if you want an even better one, sit on row 50. I flew twice FRA-JFK LH400 in a two week period and sat in 61C and 62H. On both occasions the flight ran out of meal options. The first time they told me to order a special meal to avoid this issue, which I did. However LH failed to load my meal onto the plane so was stuck with whatever food they had left over. Unusually, the front rows of Economy (e.g. rows 60-65) are served last on the LH a380. Do not sit here if you are hoping to get a choice of foods to eat and if you don't want to wait an hour between drink service and food service. The flight attendants literally unload on you whatever they have left on their carts. LH needs to plan better- never have this issue on a330 or a340. I chose this seat purely for the fact that it was an aisle seat and besides, the top deck seats filled too quickly.There is an IFE box in the seat infront resulting in smaller leg room. And sadly, just my luck, the air opening above would leak droplets of water haphazardly. Advise to avoid. Seat in front has entertainment hardware installed below. Therefore this set has limited legroom. Great seat. Plenty of legroom as it is slightly off the stairs. No traffic from the stairs, and even the largest person have enough space! Excellent seat and worth the extra $$, no seat in front so plenty room and easy entry/exit. Having the screen and table in the arm rest was not really noticable. Awesome seat and spacing. Important to note thst seat is a bit farther away from the bulkhead. Extra space for storage on overhead and bulkhead is nice. For me this is the best seat you can get on LH Premium Economy.It has a lot of legroom ond no seat in front of you. So it's very esay to leave your seat without bothering the person in 50C. Secondly it has a real leg rest, which only the bulkhead seats in premium economy have. I'm astonished that nobody mentioned that before, because that's the best feature for me. It's like like an older version of a business class seat. The other seats only have a foot rest, which doesn't relieve your legs at all.It's also very quite. No passenger traffic, as ther is no galley or toilets in the front. Window seat has extra room between the seat and the wall of the plane as it curves out, which can serve as room for extra storage of blanket, jacket, etc. No media box under the seat so leg room is fine. Media box is actually under the middle seat. 64K's over the wing but still decent view. Seats D, E, F, G in row 76 are awful. The wall separating the lavatories from row 76 is too close to your knees. I'm 5'8'' and I was very cramped and uncomfortable. Bad seat - IFE box under seat in front of it (61C) makes for a very uncomfortable experience as there is no way to put both legs comfortably under the seat. There is a "box" underneath the front seat that makes impossible to stretch the left leg. In general, I love this mini-Economy cabin on the upper deck. One problem with 96H (and probably 96C too) is that there is a very large electronics box under the seat [ahead] which takes up almost half of my leg/foot space. Also, the seat frame of 95H is solid down to the floor (not an open frame) which precludes my poking my feet out to the aisle. I think LH Premium Economy on the A380 is a truly valuable product. Differently from other LH planes - where Eco Premium is placed right in between regular Economy class, the A380 offers a completely autonomous space. I fly regularly to HKG and I always pick rows 54 or 55 A-K. Not only there is additional room on your window side, but you distance yourself from all potential sources of disturb. Sufficiently far from lavatories, from the stairs and other areas where people get to stretch, as well as away (although never enough) from crying babies in both Eco Premium and regular Economy (the cradle can be set up on rows 52 and 61). The seat is very comfortable, although the footrest could have been designed better. It feels they wanted to make sure the Eco Premium seat could never be as comfortable as the Business class one. One really can't use the footrest to sleep on a more comfortable position: the metal bar will destroy your feet. Nonetheless, the service on board is excellent, with the only remark that I would further enjoy my trip if there was a menu specifically designed for Eco Premium rather than having the same of regular Economy just on a better set. I would strongly recommend this seat for those who travel overnight and wish to have a full night sleep. The seat was slightly annoying, due to the fact that the inflight entertainment screen was off centre from my seat, due to there being 4 seats in the row in front and 3 in the row I was in. This caused me to have to lean over in order to comfortably watch the screen. My son and I are both close to 2 meters tall and were in seats 50H-K in Premium Economy from FRA-SFO. Flight was great. I have also flown this leg in the upper deck business class, and would say these two seats come close on a day flight where you don't plan to lie flat to sleep. My son wants me to book the same seat for him on the way back (and he's taller). Leg room is good, and TV screens are fine even if in the seat. Crew and service all exceptional even though flight was packed, and food was decent (I'm not a fan of airline food and "decent" is a relatively good rating for me). We arrived fresh and rested. This is how Premium Economy should be. Even though the seat is close to the lavatory, it is usually used by the economy class passengers on the upper deck, therefore it is not that bad. Only comment on this seat is that, the TV screen is not directly in front but aligned at an angle (since there are 4 seats in front vs 3 seats in row 99) therefore it is rather uncomfortable when you are using the screen or tray. More or less just a standard seat. Being in a row of four, this area is nice for families of four (or if you are just a party of four). First time to fly Lufthansa Premium Economy and was very impressed. In particular, these seats in row 50 have a terrific amount of leg room. I was able to easily get past the person in the aisle seat without disrupting her. I sat in 54F on the way back, which did require asking the aisle seat to get up. What I find particularly noteworthy about these seats is both the leg room and elbow room. Wide seats with wide armrests keep elbows out of competition. Food was decent. I typically fly United and their Economy Plus does not even come close. Next time I fly to Europe, I'm flying Lufthansa Premium Economy. Nice setting. The window seat (18i) would have been even better with more compartments to stowe your personal stuff. Not too close from toilets ir kitchen so relatively quiet. Flat bed but a bit hard. Not so much space to turn but enough for a good sleep. The seats 52D-G are not bothered by the stairway as indicated in the map. The stairway opens to the front of the plane behind a curtain. The overhead compartment is blocked by emergency equipment. The upper deck is phantastic! Its a bit private and quiet there. The right hand seat in row 99 is near to the lavatory so it's bothersome, especially on night flights when the door gets open and the light shines through the cabin. Recline is fully possible. The left hand seat has 2 full armrests (traytables), so it's a bit narrow then the other 2. Because the row 99 has only 3 seats the TV monitors are slightly off-center for each seat. On seat in front has a non working TV monitor. All in all the upper deck is very recommendable for economy class. The electronics for the in-seat entertainment are under this seat in the middle block, so leg room is slightly reduced in width (though not the most intrusive I've had. Flew from FRA to HKG. Seat was OK, comfortable enough for me--170cm tall and 65kg wt: so the 31 inch seat length was adequate with a few inches spare between knees and the seat in front; 18.2 inch seat width was just about adequate. The passenger next to me in E was quite petite and so no issue of shoulder-rubbing. My guess is that two 80kg or above passengers sitting next to each other would find themselves rubbing shoulders with each other. There were no adjustable side-head rests. IFE metal box was under seat 86G so my leg room was unrestricted. The seat reclined OK. There is a gap between the seat and the galley so you can tug away a bag or something there. As the seat is right in front of the galley, cabin crew chatting away during their free time could be disturbing your sleep. IFE choice was good, but they shut it down once the plane was parked up so you had to sit there staring at other passengers while waiting for 20min or so to be let out of the plane. 2 meals (evening, breakfast) plus plenty of drinks, but no sandwich/pot noodles if you were hungry in between. Food was not bad at all. Cabin crew service was good. I like the A380 external cameras which allow you to get a similar view as the pilots, esp. when the plane approach the destination and land. All in all an OK experience. I've traveled too many long haul intercontinental flights to count. By far, the economy class on Lufthansa's A380 was the most uncomfortable experience in my lifetime. Narrow seats with hardly any legroom. The pitch is too steep and the seats themselves were akin to torture. I was so excited to fly on the A380 for the first time, but I now need a chiropractor just to recover. Terrible. Spend the extra to get into plus or fly on another aircraft. The seat should have status "Bad Seat" and be marked with Red. Even its Emrg. row seat does the extra leg room on this not even close offset the disadvantages of people lining up for the bathroom. I was kicked, had me feet stepped on for 11 hrs. by people going to the bathroom  it was like being in a torture chamber the whole trip. I asked for another seat on board  but could not be reassigned to another seat onboard. I am frequent traveler and this was by far the worst flight I ever had. These seats should be removed from long haul flights. FRA to SFO, seat 2G. Very comfortable seat (and bed) with dividers that can be raised for further privacy. The service and food were excellent. The cabin was very hot. The galley for both first and biz is right behind this row; it was very noisy for the whole flight despite the insulated doors. I know this was a daytime flight, and it's much quieter on the night flights to FRA. Next time I would sit in row 1, as there is nothing in front except the lavs. On 96C you have on the left the large entertainment box and on the right the seat strut. The space for your feet/ legs are around 30cm (12 inch). As adult you are not able to stretch your legs straight forward and always hit the box or the strut. All 8 upper deck economy window seats (95-98A, 95-98K) have extra room for wide shoulders because there is an 8" deep ledge that runs down the outside of the airplane. This opens from the top to store small carry-on bags for rows 96-98. Row 95 loses out on the storage due to the exit door, but still has the extra width at the shoulder and elbow area. The IFE boxes are under the seats in front of 96E and 96F which makes leg room too tight for anyone over 165cm tall. My 183cm / 6 ft tall friend had to switch seats because of that and luckily there was another seat available. It is odd that they have better legroom in smaller Airbuses for short haul flights than in their biggest aircraft used for the longest flights. Very good seat, but the entertainment box however takes up half of your legroom which was really uncomfortarble. Same happened with 97K. I am not sure why the current comment indicates this seat (pair) of seats would be good for couples, and not so much for solo travelers. If anything, you have less intimacy than in the rows behind. To add: The video screen is in the arm rest and needs to be stowed for takeoff and landing - a disadvantage compared to all other rows in this cabin. Flight from FRA to HKG. Perfect for sleeping as there are less than 40 people for the economy class on the upper deck. TV and table are stored in the armrest - slight inconvenient when adjusting the TV during meals. Recommended to pay extra to secure a seat on the upper deck for long-haul flights. Great Seat with lots of space. very quite. but i prefer Row 51 because the legroom under the row in front. For people under the size of 176cm it´s really fine. Be aware that if you have a laptop and a carry-on backpack for it you might have challenges with room. This row is just behind the bulkhead row so there's extra gear in boxes taking up all the foot-well space. Laptop bag had to be put overhead and being buried against the window there were 2 people to get over to access anything not stowed on your lap (there is no seatback storage either). Most uncomfortable and wasted time in flight I've ever had because I really couldn't work on my laptop due to lack of space or needing something from the overhead. A good seat one of 3 at the rear of the upper deck. Plenty of room and space behind seat. Only issue was light from toilet next to 99F at night, if people used curtain there would not be a problem. Quick disembark. Seats 52D and 52G have unlimited legroom. The stairs are only in front of seats E & F. The stairs open to the front and are not frequented at all, also there are no passenger lavatories. So a very quiet seat with huge legroom. But the screen is quite small and has to be stowed away in the armrest during takeoff and landing. I would remark the fact that suitcase space overhead is severely limited and it will not fit anything thicker than a briefcase and a jacket. My backpacks barely fit, wheely bags are a lost cause. Great seat - smaller tv then others in same class. I absolutely agree that the upper deck economy is the way to go on this aircraft. The window seat has extra room and a cubby compartment about 6 inches wide and deep enough for a lot of storage. Seat 97A and K are the best choices to maximize storage because it has access to one whole side cubby compartment and half of seat 96A's compartment because of the way the seats are laid out. There is a gate that keeps people off the stairs during flight and a curtain that seperates business class so it feels like you are on a plane that holds 35 people... and since the upper deck is primarily first/business you get faster boarding and deboarding even though you are in the back. 52G and 52D are bulkhead seats but do not have a wall in front but freee space. These seats are great with a lot of room for your legs. Correction of exiting con (is valid for all seats in front 50ACHK and 52DEFG): The stairs do not bother as 1. there is a curtain, 2. toilets only for the crew and 3. there is no passenger traffic during the flight. I received this seat automaticaly when check in at machine. Last row in cabin so can stay confortable. Big enought seat and room for legs and photo case. Better than 97C! It is a good seat for stretching legs but, everyone will bump in the dark, going to lavatory.Very quite cabin, updeck. Problem with headset, are disposable/ recycled..
fist row we were not bothered by cabin stewards in working in front of us. But, we are short, so take that into account. Seat was comfortable. But, bedding was not as good as we had expected. Somewhat lumpy. Worst long haul flight ever. The seat width is not bad but pitch is low which makes all extremely cramped. Too high recline possibility for economy seat results in having your nose centimiters away fom the screen and absolutely no space at all. The only long haul plane that gave me leg cramps after 6-7 hours of flight. 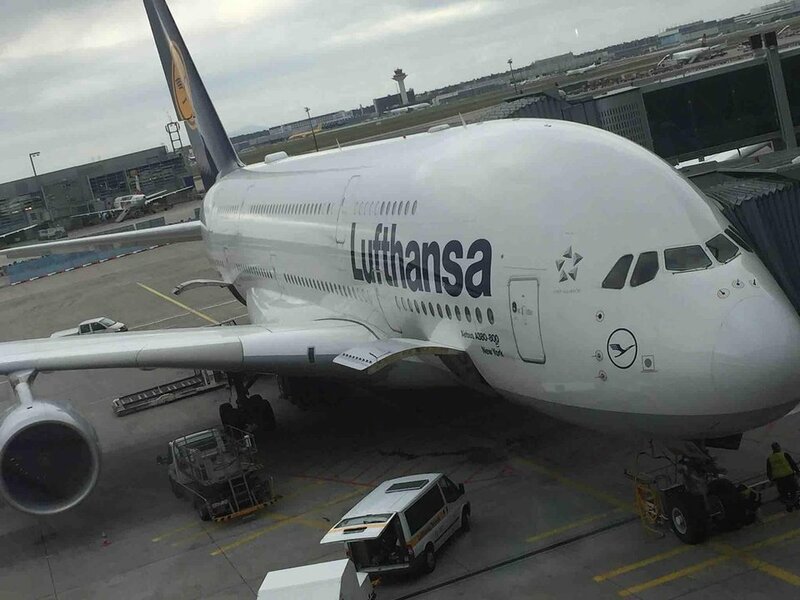 Avoid Lufthansa's A380 at all cost unless you can get a premium economy or higher. 50K is probably one of the best premium economy seats on this plane. It's a bulk-head window seat with lots of extra legroom. The only draw back of this (or any other bulk-head seat) is the smaller inflight entertainment screen. SeatGuru lists the proximity to the lavatory as potentially bothersome, but actually there was no lavatory in the front section near this seat (lavatories are behind the premium eco section). Also there was no galley in the front section near this seat - its where the stairs lead up to business class and where flight attendants have their seats. All in all a very nice, quiet, roomy seat. Would recommend this seat and seat 50 H for two people travelling together. Would also highly recommend this seat for solo travellers who want a window seat but also get up often as it is easy to get out without the person in the aisle seat even having to get up. After the row 95, seats 96-98 A & K are probably the second best choice on LH's A380s. Generally the upper deck economy cabin is very recommended, as quiet, small and wells served by a dedicated FA. Window seats in rows 96, 97 & 98 feature one extra - an additional closing storage compartment between the window and seat. It won't hold a suitcase, but it will easily accomodate several slim bags or backpacks. And when closed, it forms a very convenient shelf for drinks, books or whatever you might want to have at hand. Of note is that 98 A, B, J & K recline fully, despite being the last row before galley and lavatory. Lavatory presence may be a bit bothering sometimes (so A & B are better choice, also get food served earlier). All in all - highly recommended seat, or group of seats. This is quite possibly THE best economy class seat on this plane. It's a bulkead seat, but bulkhead is narrower than the row of seats, so legroom is absolutely unrestricted. And the small economy class cabin at the end of the upper deck is generally very good, as it has its dedicated flight attendant and is small, therefore quiet. Row 95 A-F also gets food first (they may run out of choices before the 99!). The only drawback is obviously the armrest table/monitor, which prevents you from using entertainment system when taxiing, during takeoff and landing. Still, it's an excellent seat, really. Average business class seat at best - limited storage (window seats have additional storage), only a small area to put feet on when seat is completely reclined. No privacy as there is no divider between seats. 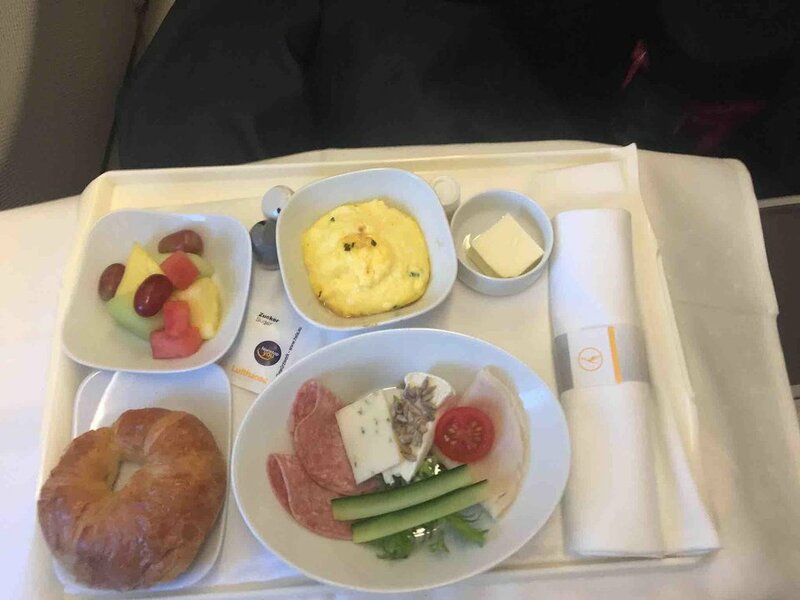 Lufthansa food and service are good, but not outstanding. The smaller rear business section means less traffic during the flight, but will be one of the last off the plane after landing. All 3 seats in row 99 are not aligned behind the seats in row 98. As a result, the TV-screens and seat pockets are "diagonal" and not directly in front of the passenger. Upper deck quieter & more personal service. This seat has restricted leg space due to entertainment box. Also it seems all the middle segment seats have less leg room than the 2x side seats. Very tight. I agree with most previous comments regarding the upper deck eco section. It's a lot less crowded and the seat arrangements (2-4-2) together with the curvature of the fuselage make a window seat much more appealing than on the main deck. Overhead storing worked fine for me (suitcase with maximum measurements permitted for carry-on items). Would recommend a window seat upstairs. The close proximity to the washrooms is REALLY painful. Limited leg room due to the entertainment box of the front seat. This seat has no baggage room upside due to the emergency equipment stored. Seat 99F is right next to the lavatory, with the toilet door opening directly onto the seat. This may be bothersome with odours and queues of people using your seat as a hand rail. I'd advise against choosing seat 99F. Mixed review, because of multimedia box on the ground of the front seat. Very uncomfortable fort the legs. The seat has limited leg room because of the entertainment setup. It takes up half the space for leg room. 99F is the seat with the highest seat number in this plane. Because of only 3 seats in this row the inseat entertainment is slightly offset from the centre point of view. However it doesn't really disturb. The legroom isn't different to the other economy seats. The pitch and the width are standard. 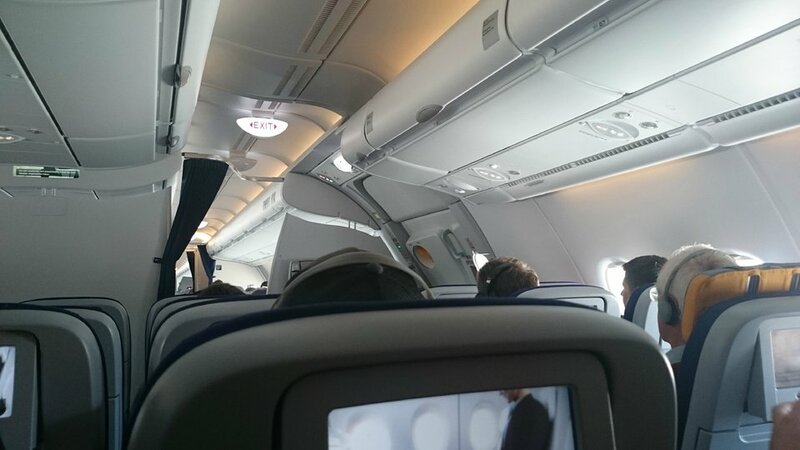 In the upper deck are only 5 rows of economy so there is a very familiar atmosphere. One flightattendend is there on duty. You get you meal and refreshments very quickly. You only get bothered by other passengers on there way to the lavatory, specially on night flights when the light cuts through the darkness of the cabin. A minor downside to row 24 in Business Class is that there is a bulkhead economy row directly behind you, which featured several babies on my flight. Other than that, the new seats are a nice improvement from the previous ones. Frequent flyer (*G), first time experiencing the A380. 95K is fantastic - I completely disagree with the current "Red" rating which I assume is due to lack of a window - for an overnight flight the window is pointless anyway (do you really need to stare at a shuttered window pane for 8 hours? ); wouldn't you rather have meters of legroom, a somewhat private cabin and no-one tripping over you to use the restroom? The upper-deck mini cabin is extremely private. Leg room is ridiculously spacious - a couple of meters due to 95K being an exit row. Seat width was also great - although the wall curves in (so no side storage) there is still a small ledge on the where I was able to store my headphone case, toiletries bag and a few other small items. The right arm rest also folds up to give extra elbow room. I would highly recommend this over the aisle seat (95H) due to the extra elbow room and storage (95H has no storage). There is a single toilet in this cabin however when it was occupied I simply walked downstairs to use one of the 4 additional toilets available at the bottom of the stairwell (as such I never had to wait during the entire 10 hour journey). I also walked the entire length of the downstairs deck to explore the other cabins (including premium economy) and would highly recommend the upper deck compared over any of the other sections (excluding premium economy which was indeed quite private spacious at the front of the lower deck). The only downside is overhead storage on the sides (rows A,C and H,K) is VERY small (akin to a regional flight - good luck trying to fit in anything larger than a laptop case or large handbag). However, the center-row overhead storage is normal size so I was able to utilize the center bins for my (medium size) overnight bag. Others who did not have priority boarding though ended up storing their bags in the business class bins in front of the mini-cabin - the Lufthansa crew were very helpful with this though so it wasn't any issue, plus as the entire upper deck exits from the same front exits there were no problems for folks grabbing their luggage from the business cabin as they exited. Best single seat on aircraft. Lots of legroom and relative seclusion without lavatory waiters congregating in front of you. Over wing so no view through window. So quiet. The flight attendants are marvelous even checking lavatory supplies during long flight.food fairly good. The 3 seats are misaligned with the tv's in front of them, so you cannot look straight ahead to watch TV. Also, they have the traytable in the armrest for slightly reduced width. Full recline, however. This economy section at upper deck is truly the worst economy class I've ever flew in. The overhead compartment for your luggage is much shorter than regular, especially for the side seats; I reckon the height is just 30-40cm for the side seats, it could barely fit anything. Those who seat at the window may have some compartment at the window but good luck to the aisle seaters! The worst has to be this 96C seat. There's a humongous IFE box at the feet that I couldn't even sit straight. Worst was the safety jacket stuck underneath the front seat, making the space even smaller. I could only fit my shoes in and that's it! Not to mention the seat is narrow. I'm a slim-built 158cm person and I had the armrest digging painfully against my elbows. Truly horrendous seat, especially for a 12-hour long haul flight. I shall avoid Lufthansa long hauls on an A380 from now onwards. Just flew from SFO to Frankfurt on Premium economy. Well worth the extra cost of economy. The seating was very comfortable, entertainment monitors were larger than standard economy. The only reason to fly in business is the lack of space when the seat in front fully reclines , otherwise it is very comfortable. Houston to Frankfurt: I upgraded from economy to premium economy on both outbound (seat 57C) and inbound (seat 57H) trips. I really liked row 57: there's no row behind or to the side of you, which gives more sense of privacy. The seat was very comfortable, and I have no regrets about spending more for such a long flight. Note about upgrading: on both flights the flat fee was 299 Euros to upgrade, and there were plenty of seats available. A couple folks bought their upgrades on the plane after boarding. If you've already paid a seat surcharge (exit row), you likely will lose that. I was very excited to travel in the upper deck of the A380 but I did not enjoyed it as much as I though. I like travelling in the front of the plane and this seat reminded me why. The noise of the engines was constant and I could hear every change in speed. That aside, the bad point about this seat is that the entertainment system is on the bottom left hand side of your feet space, this means that your left foot has to steer to the left reducing the feet space considerably. The upper deck is fantastic, particularly the window seats. First, because of the curvature of the plane, there is about 8-10 inches between the seat and the window. However, rather than have empty space, Lufthansa has installed small "drawers" of sorts to store one's stuff. As a consequence, one does not need to put anything under the seat in front because there is both overhead bin space as well as these little drawers between you and the window. Second, because there is only business class on the upper deck, you can exit the plane far faster. For example, I was off the plane before they had even connected the jetbridge to the lower deck. I'd highly recommend an upper deck window seat. 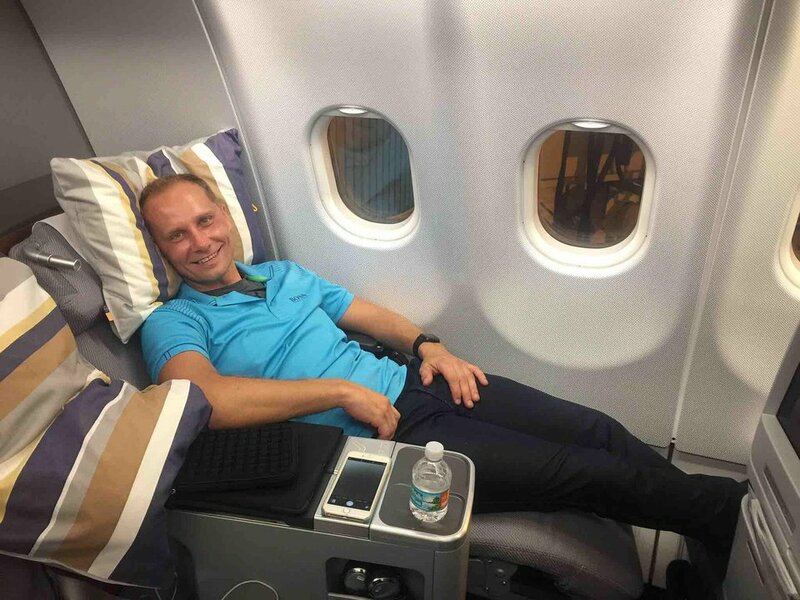 This was my first experience of Premium Economy with Lufthansa. I recommend the extra cost for the FRA-IAH flight time. There was ample leg room due the bulk head but of course you then have to have a screen on an arm. The foot rest and seat adjustment was great for me. The lavatory comment does not apply since this is not available to passengers (curtain has crew only written & not entry sign). Instead there are 2 WC's at the rear for Premium economy only. Lufthansa flies 1 versions of Airbus A380-800.